These hermits are considered to be reef safe janitors. The Dwarf Blue Leg Hermit Crab or simply Blue Leg Hermit Crab has blue legs with red banding. Both claws are of equal size, and members of this genus are sometimes called "Equal-handed Hermit Crabs." This tiny crab lives in abandoned snail shells, or it may attack and eat the snail, then use the shell for its home. The Dwarf Blue Leg Hermit Crab (Clibanarius tricolor) is a great addition to a saltwater aquarium because it eats many kinds of algae, including red slime algae (cyanobacteria), and sifts the sand, as well. The Dwarf Yellow Tip Hermit Crab has bright yellow bands on its green to black legs making it stand out in almost any aquarium. The Dwarf Yellow Tip Hermit Crab (Clibanarius sp.) has a small size (to 1") that allows it to get into all of the nooks and crannies in a reef tank. The Zebra Hermit Crab (Calcinus laevimanus) gets its name from its distinct coloration. C. laevimanus is named for its colored pincers and the white or orange bands that dress its otherwise dark legs. Like other members of the genus Calcinus, the Dwarf Zebra/Orange & Black Hermit Crab also has long eye stalks. However, this particular crab's eye stalks are a brilliant blue and fade into an orange-tinged upper half. 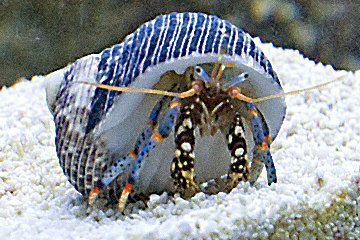 The Electric Blue Hermit Crab is rare in the saltwater aquarium hobby. Found only in the Marshal Islands, it is infrequently shipped to the Mainland. This crab has electric blue legs with black banding, and its antennae stand out with its bright orange color. Both claws are close to being equal size and are brownish green in color. It grows to about 2" in size. The Electric Orange Hermit Crab is endemic to Hawaii and has bright orange legs with brown banding and has unusually blue eyes. It grows to about 2" in size. The Electric Orange Hermit Crab (Calcinus sp.) is a great addition to a saltwater aquarium because it eats detritus, uneaten food and many kinds of algae, and sifts the sand, as well. The Halloween Hermit Crab is endemic to Hawaii, grows to a very large size and may bulldoze rock work and other obstacles it comes across in the tank. The Left-Handed Hermit Crab (Calcinus laevimanus) is so named because its left claw is considerably larger than its right. If a predator attacks, the Hermit Crab can back into its shell and use the large claw to block the entrance to its shell. It has long eye stalks, the lower half of the eyestalk is blue, and the upper half, orange. It grows to about 1" in size. Found in Hawaii and the rest of the Pacific Ocean, this terrific little reef safe crab spends its time seeking out algae (even Red Slime Algae), detritus and decaying material. Also known as the Red Reef or Red Legged Hermit Crab, the Scarlet Reef Hermit Crab is named for its bright red legs and a yellow face. Native to the Caribbean and Western Atlantic, growing to a size of 1 1/2".